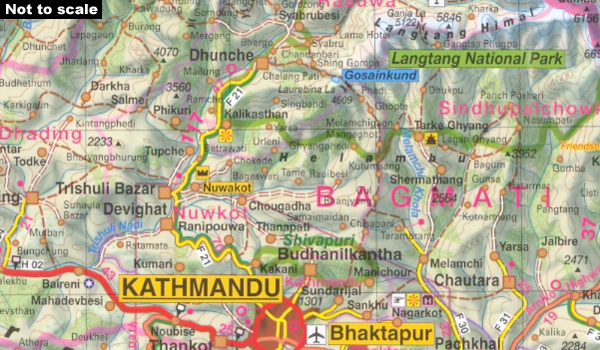 An overview map of Nepal from Gecko Maps, Swiss cartographic publishers specializing in coverage of Tibet. The map includes enlargements for Kathmandu and Pokhara Valleys, a comprehensive distance table and climate information. Bold relief shading is supplements by colouring and graphics to indicate different types of terrain and vegetation: high mountain chains with glaciers, the highlands, grassland, forests or shrubs, agricultural land, swamps, etc. Many peaks are named but perhaps not always easy to find among all the information provided on the map. Road network indicates picturesque routes. Main trekking trails are marked. The map shows the boundaries of national parks and highlights locations and natural features of particular interest. Latitude and longitude lines are drawn at 15’ intervals. No index is provided. Map legend includes English. Enlargements show Kathmandu and Pokhara Valley at 1:250,000. Also included is a comprehensive distance table and month by month graphs showing mean monthly temperature and rainfall for 20 selected locations.